In a small saucepan over medium heat, combine the jam, butter and brandy. Stir occasionally until well blended. Reduce heat to low and stir occasionally while preparing crepes. Note: For a chunkier topping/filling, chop 1 or 2 canned apricots and add to the mixture as soon as the jam and brandy are well combined. Heat a frying pan to medium. Give it a very light spray of cooking oil. Drop the crepe mixture onto the heated surface. Using about a 1/4 cup of batter for each crepe. Tilt the pan with a circular motion so that the batter coats the surface evenly. "Thin is in" when it comes to the layer of batter. plate. Place waxed paper between cooked crepes to prevent sticking. Brush each crepe with a heaping teaspoon of the filling and roll or fold each crepe according to preference. Drizzle any remaining filling over all completed crepes. Sprinkle with toasted almonds and powdered sugar if desired. Serve and watch your family smile. 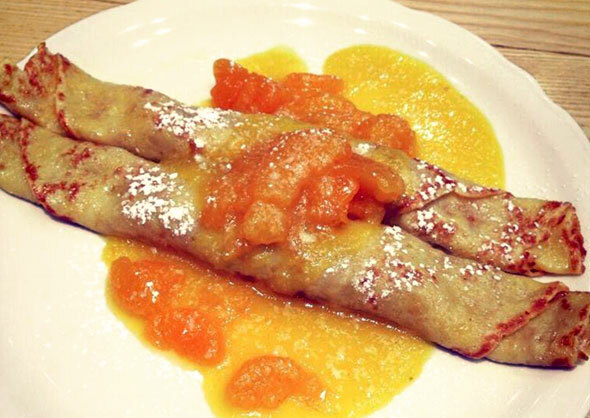 A filling made from apricot jam and a little brandy make these crepes elegant and delicious. You can use store-bought crepes or use the bonus crepe recipe included. Recipe number 1896. Submitted 11/18/2006.